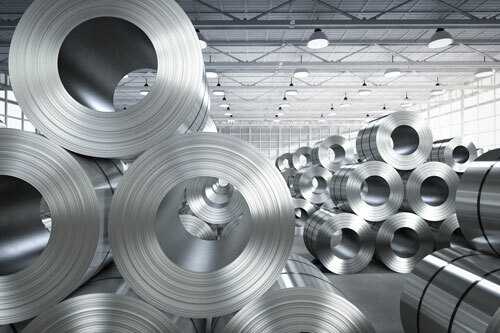 Tick-tock…tick-tock-there's a deadline looming for metalformers, toolmakers and service providers in the automotive supply chain. All automotive-part manufacturers and service providers currently certified to ISO/TS 16949 must transition their quality-management system (QMS) to the new IATF 16949:2016 standard required by most automotive OEMs by September 14, 2018. After September 14, legacy certificates of compliance, proudly held for years, will become officially obsolete, regardless of recent surveillance-audit results. Automotive suppliers, where their customers require compliance as a condition of providing products and services, must migrate to the latest automotive QMS standard. If a supplier receives a major finding (major nonconformity) and, therefore, fails to achieve certification in an original transition audit, it may be weeks or months before a follow-up audit visit can be scheduled to resolve the major finding. A missed September deadline may be the result. Furthermore, those not transitioning to IATF 16949 may lose business from their automotive customers. This industry dynamic presents a tremendous opportunity for automotive suppliers to proactively minimize risk and assure customer satisfaction by embracing the principles and requirements of IATF 16949. Transitioning a QMS to comply with this new standard can be accomplished with a focused, thoughtful and enterprise-wide initiative led by engaged senior leadership and frontline managers. 1) Update your QMS around your own business processes, not the IATF 16949:2016 standard's structure. Some organizations may be tempted to update their QMS with a list of IATF 16949 headings, sections, sub-sections and clauses into which they try to fit pieces of their actual business-process definitions. Quality leaders at these organizations mistakenly believe that organizing their QMS to mimic the IATF 16949 structure will make it easier for a registrar to conduct interviews and assessments during an audit. Unfortunately, this approach can cause the updated QMS to appear foreign and complex to colleagues in the organization responsible for business, operations and management processes. If process owners are uncomfortable with a stylized QMS structure not based on their own processes, they may not respond efficiently and accurately to the auditor during onsite interviews and QMS reviews. This can increase the risk of cited nonconformities. When a company organizes and writes its QMS around how it conducts business in the front office, production floor and warehouse, employees can find and apply important information on how to do their jobs. They can better work together to produce quality products and deliver consistently good services for their customers. Then, with familiar procedures, plans, activities and evidence clearly defined and readily accessed, a cross-reference mapping of the organization's QMS elements to applicable IATF 16949 requirements becomes easier to complete. Organizing a QMS around the way a company does business provides the intuitive clarity that makes the QMS easier to use for practical daily decision-making and easier to maintain in the long-term. Transitioning to IATF 16949 demands a full-on commitment, with future automotive business for your company hanging in the balance. 2) Treat the transition as an enterprise-wide project, not a job for the quality department to simply update some paper or electronic documents to "make the auditor happy." IATF 16949 is based on the concept that a supplier organization takes the standard's requirements seriously and commits to using its updated QMS to guide strategy, planning and execution of business processes. The new standard's emphasis on risk-based thinking means that robust and effective risk management must be embedded in all business processes across the entire enterprise, including management planning, actions and review. Also, it provides an expanded focus on product safety assurance and traceability to help control quality prior to shipment and speed responsiveness in the event of an investigation or recall. 3) Presuming that this significant mandate will be satisfied by some adjustments to documents in a quality department repository is to misunderstand the intent of the standard. Treat the QMS transition to IATF 16949 as a major improvement project with a full deployment of resources and team assignments, and set and manage project goals. These goals and supporting milestones must include regular reviews with senior leaders who need to stay engaged throughout the entire QMS transition. Wise advice combined with proper oversight of the transition process proves valuable. 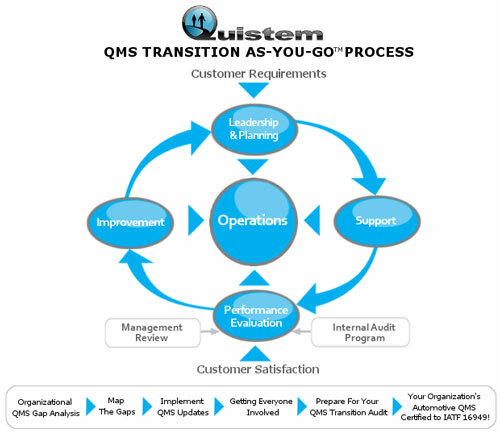 Given the relatively short timeframe remaining to transition a QMS and pass the certification audit, expert guidance can steer an organization along the correct path for planning, preparing and deploying changes, as well as validating the updated QMS through internal audits. Seek support in assessing the current state of the QMS and planning next steps to ensure that all IATF 16949 requirements are addressed as simply and straightforward as possible. This can help a manufacturer avoid the temptation to "boil the ocean" by creating an overly detailed, complicated system. Later this spring, co-author of this article, Cathy Fisher of Quistem, LLC, will offer a virtual learning series on transitioning an automotive supplier's quality-management system to IATF 16949. For details, visit www.quistem.com. Timing is critical in meeting IATF 16949 requirements as a condition for keeping and winning business. Thus it's appropriate to retain a voice of experience that assists the transition team. An objective observer can accurately and honestly assess the current state of the QMS, and then assist with planning changes needed to assure that all IATF 16949 requirements are addressed. 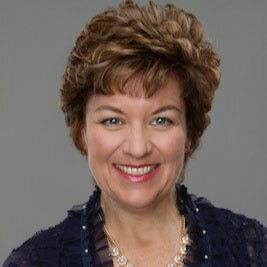 Cathy Fisher is president of Quistem, LLC, Mt. 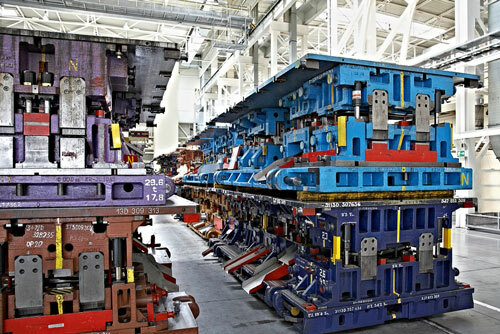 Pleasant, SC, which helps automotive manufacturers implement and maintain management-systems structures. With more than 30 years of expertise in the quality industry, Fisher has led hundreds of organizations through their initial quality-management-system (QMS) implementation and registration, as well as transitions of their QMS over the past four revision cycles of the Automotive QMS standards. 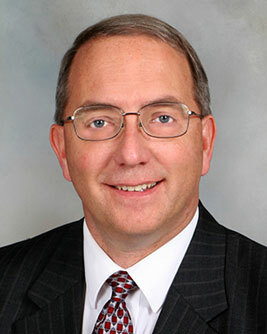 Ed Potoczak is managing member of the Oakstone Group, LLC, Rochester Hills, MI, a provider of consulting services to small and mid-sized manufacturers on quality management, compliance, attracting and retaining workers, planning for software implementation, management systems, cost reduction, and improving customer relations. Potoczak has more than 20 years' experience in engineering, technical sales and operations, and applying enterprise software in industry.